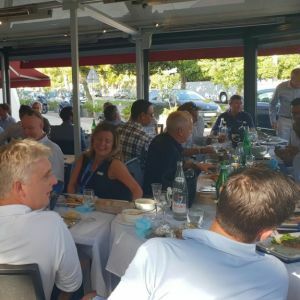 The afternoon started with a champagne reception in Antibes, thanks to our generous sponsor Standard Bank International, who manage bespoke bank accounts specifically for yacht crew. 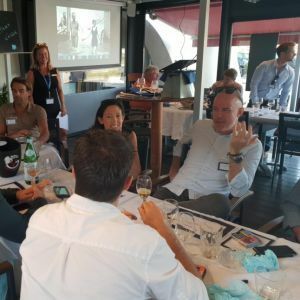 The chilled champagne was flowing and then we all took our seats to enjoy a delicious meal whilst swapping hilarious, and sometimes shocking, stories from all our experiences in the charter and yachting industry. 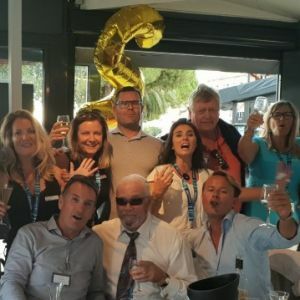 Zelda Swindell, along with her team; Bertrand Mattei, Jackie Baker and Julia Migliaccio, were joined by our sales team and crew ladies; Becki Milton, Louisa Gallimore, Sharon Rose and Natalie Hedley-Ford, as well as Richard Callender from the Sales department. 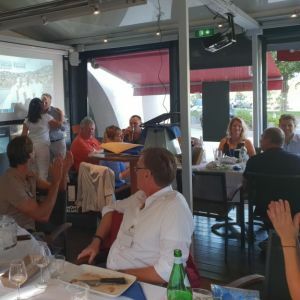 The afternoon got more raucous and the laughter even louder, before we came to our awards ceremony, and fantastic gifts from Mont Blanc. First award was given by Natalie Hedley-Ford, our enigmatic ONE Account manager, to our longstanding ONE Account supporter. This gentleman has enjoyed over 30,000€ in free training from us as well as unlimited access to our crew database and CVs. Congratulations Timmy Attard on S/Y MELEK for being our most Loyal ONE Account Captain. 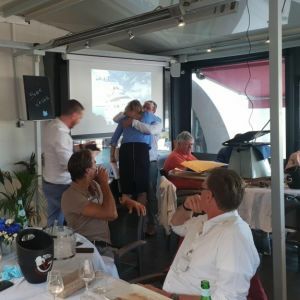 Next award was given by Richard Callender, our charming Charter & Sales Specialist, to a captain who has completed the most days of charter in a season. In 2014 he completed 71 days in a single charter season, not including the owners use! 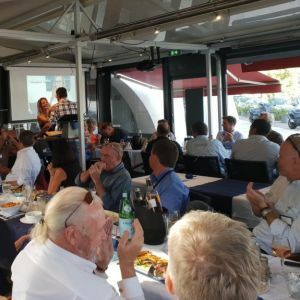 Captain Wayne Jones of M/Y RHINO A collected his gift and certificate for the busiest season in 20 years with a huge “thank you” for never saying NO! Julia Migliaccio, our exuberant charter assistant, gave the next award with her usual northern charm and wit! 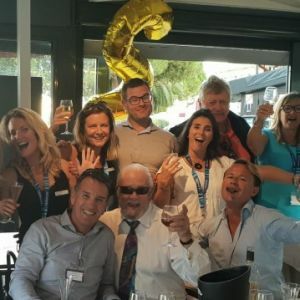 The award for Most Popular Charter Captain who has had 8 years with Bluewater, 50+ weeks of un-faulted charters, 600+ happy charter clients, highest crew longevity across the fleet and rated by brokers as a 5* Captain, went to Captain Ben Baylis to lots of cheers and whoops. Jackie Baker, our funny and gregarious charter manager, wrote a poem for one lucky captain. See below to read it in full, it was much enjoyed. Congratulations Captain Freddy Riot, we hope you enjoy your gift and certificate for The Most Enthusiastic Captain. Becki Milton, our gorgeous Group Operations Manager, took to the stage next to present the award The One That Got Away. Captain Ben Leeder has worked with Bluewater and we loved him so much we keep trying to tempt him back, we will never stop trying, but in the meantime we hope the Mont Blanc goodie bag reminds you that we think you’re pretty fab. Zelda Swindell, our source of motivation and fearless leader of the charter department, gave an important award. 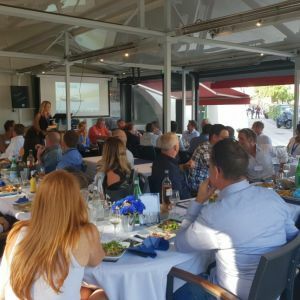 His first captain’s position was 20 years ago on a Bluewater charter yacht, the very same year that Zelda started with Bluewater’s charter department. This award for CAPTAIN OF THE DECADE was an easy one to nominate, and it went to Captain Chris Hobart - congratulations Chris and thanks for your loyalty over the years, it’s been a blast! Here’s to the next 20?! Bluewater are delighted to present this award for mega enthusiasm and for going above and beyond when the outcome is unknown. “I’ll be back” when another crazy buyer looking for a yacht walks in! !